This article was written for the Statesman Journal and published Sunday May 3rd. It is reproduced here with citations and additional images for reference purposes. 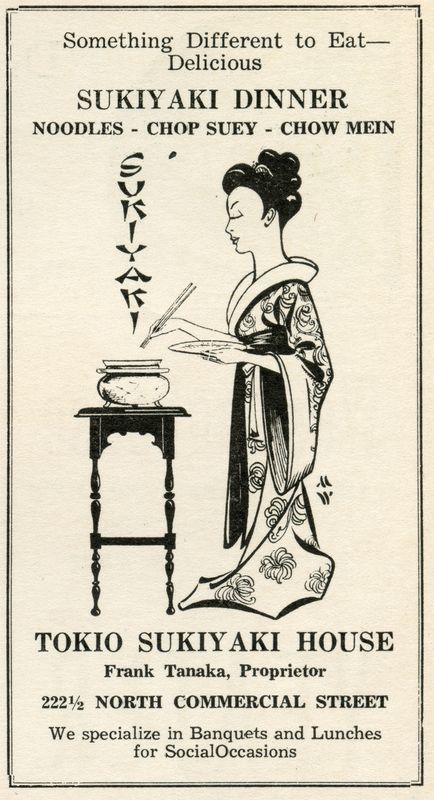 1Advertisement for the Tokio Sukiyaki House Restaurant in Salem run by Frank Tanaka with illustration by Murray Wade. Originally published April 1941 in Wade’s Oregon Magazine. Willamette Heritage Center Collections, 2008.038.0179. 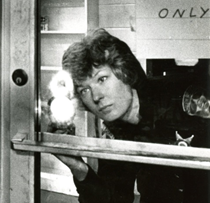 This coming summer the WHC will be diving into the history of dining out in Salem in a new exhibit. Research into this topic and the restaurant-related artifacts in our collections have uncovered some interesting artifacts and stories. 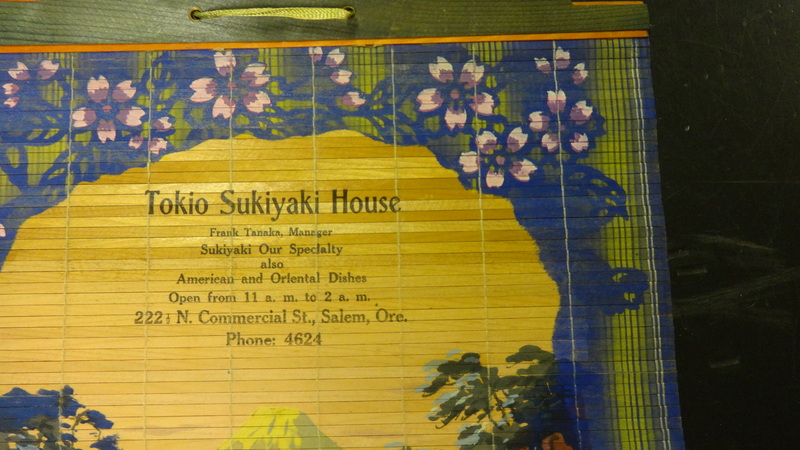 Last month, volunteer Sue Masse helped uncover the story of Frank Tanaka and the Tokio Sukiyaki House. More than just a story about a restaurant, this story shines a light on an ugly period in our community history. he came to the United States by himself as a teenager. 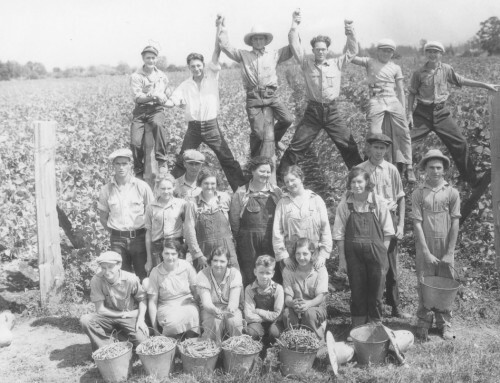 In 1910, there are two Frank Tanakas of about the right age working as cooks in Oregon – one in a sheep camp in Baker County and one working as the private cook for the Keller family in Portland. 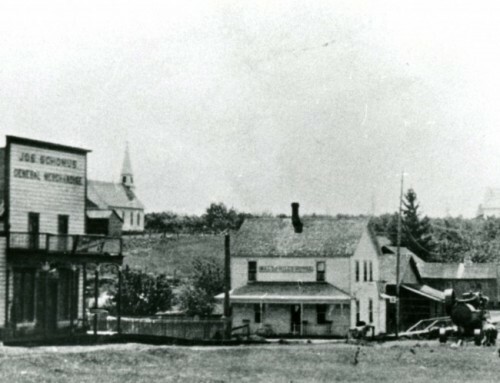 It is quite possible one, both or neither of these Frank Tanakas is the one that by 1915 had relocated to Salem and begun working as a cook for at Hotel Marion, a position he would hold for 17 years. During this time he married and had five children. In 1934, Frank Tanaka struck out on his own. His first venture, Ben’s Café, was located at 156.5 Commercial St S. In 1935, the restaurant moved to 222 ½ N. Commercial Street, above Fitt’s Seafood Market and the name was changed to Tokio Sukiyaki House, named for Sukiyaki – a Japanese soup or stew-like dish served in a specialized pot. Advertisements for the restaurant herald it as specializing in “banquets and lunches for social occasions.” The menu included noodles, chop suey and chow mein. Detail of advertising calendar distributed by the Tokio Sukiyaki House, c. 1936-1942. WHC 2014.082.0071, Al Black Collection. 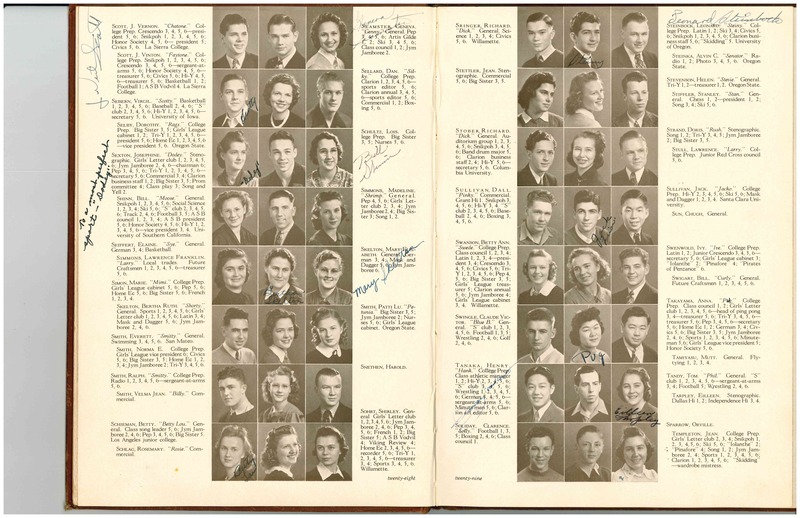 Salem High School Yearbook, 1940. Henry Tanaka is on the right page, first column, second row from the bottom. 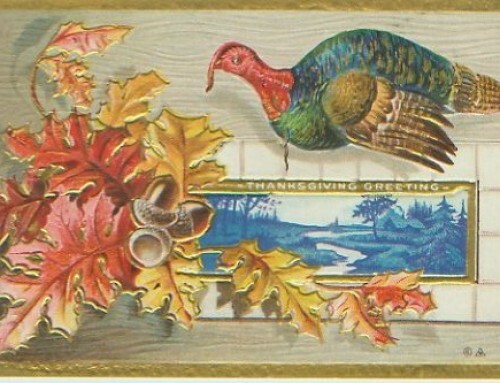 WHC Collections X2011.001.0155. Despite this patriotism, many in the Salem community turned their back on the family. Commercial Street, Salem, Oregon. Neon sign for the Tokio Sukiyaki House can be seen in center. Salem Public Library, Ben Maxwell Collection, #1416.
Business dried up at the restaurant. When the attack on Pearl Harbor happened, vandals destroyed the restaurant’s neon sign. In a 1981 Statesman Journal article, Henry Tanaka remembered walking down the street in Salem and seeing some of Salem’s Chinese residents wearing buttons that said “I’m Chinese” presumably to escape the harassment experienced by Japanese-Americans. By 1942 the restaurant had to close. Soon after the Tanaka family was forced to leave Salem for an internment camp under a presidential order to “evacuate” people of Japanese descent, regardless of their citizenship status, from the West Coast. The family arrived at the Tule Lake Camp September 23, 1943. They would stay there a year before being allowed to relocated to Cleveland, Ohio, where Frank would live until his death in 1980. 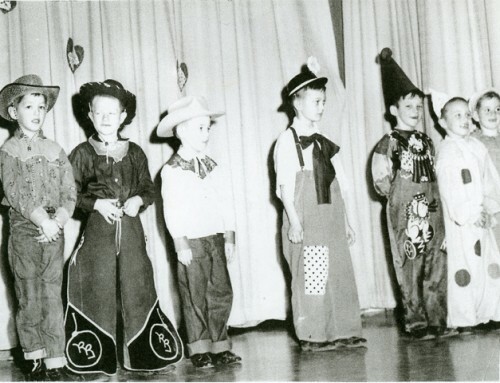 Frank was eventually able to petition for citizenship. His son Henry went on to play an active role in the National Japanese American Citizen League, serving a term as its national president. The following chart was pulled from Salem area City Directory records in the collections of the Willamette Heritage Center – most of which were from the R.L. Polk Company based in Portland. 1935 374 Tokio Sukiyaki House (Frank Tanaka) restr 222½ N. Commercial St.
1935 719 [Restaurants] Tokio Sukiyaki House 222½ N. Commercial St.
1936-37 799 [Restaurants] Tokio Sukiyaki House 222½ N. Commercial St.
1938-39 894 [Restaurants] Tokio Sukiyaki House 222½ N. Commercial St.
1940-41 857 [Restaurants] Tokio Sukiyaki House 222½ N. Commercial St. There are multiple birthdates given for Tanaka on various documents. The year and month are always September 1887, but the day varies. According to his Internment Records when he was imprisoned at Tule Lake (accessed via www.japaneserelocation.org/ and ancestry.com) and his WWI Draft Card (accessed via Ancestry.com) he was born September 26, 1887. His WWII draft card and Naturalization Petition (No. 119412 US District Court at Cleveland, Ohio dated 11/11/1954) and Social Security Death Index list Sept. 22 1887. We believe we have found a passenger list showing his arrival to the U.S. Teruhiko appears on the lists for the ship Siberia which left Yokohama port on November 20, 1904 and arrived in Hawaii nine days later. His age on the ships records was 17, which corresponds with all other documentation of his birth date. It does conflict, however, with the ad he placed in the Oregon Magazine in December, 1941, which states that he came to the U.S. in 1903 when he was 14 years old. Paul Hajime Tanaka (brn 10/5/1917) per Tule Lake Camp records, appears to predate the marriage of Frank Tanaka and Makiko which the 1930 US Census suggests took place in 1920. This would explain why Paul does not appear with the family in the 1930 US Census. “I am an American Too.” Oregon Magazine. Volume XLII, Number VI. 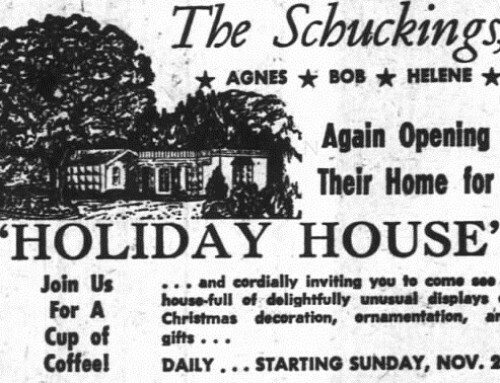 Edited December 1, 1941, pg 10. WHC 2008.038.0187B. Tanaka, Henry. “American-Born Japanese.” Oregon Magazine. Volume XLII, Number IV. Edited Nov 15, 1941, pg 10. WHC 2008.038.0185B. Manzano, Phil. 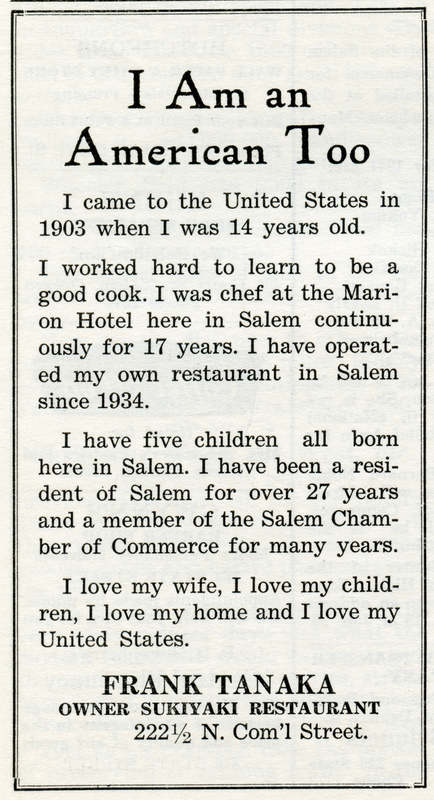 “Salem’s Japanese: How a Small Community Vanished.” Statesman Journal. February 15, 1981, pg 14A. Grave stone – Lake View Cemetery Cleveland, Cuyahoga County, Ohio; Social Security Death Index; Naturalization petition Frank Teruhiko Tanaka No. 119412. US District Court at Cleveland, Ohio. City directories list it from 1935-1941. Interveiw with Frank’s son Henry quoted in “Japanese Voices from the Northwest” says restaurant closed in Feb 1942.